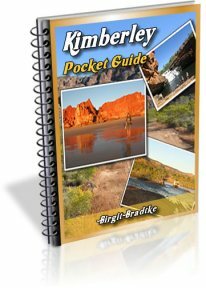 Most famous Kimberley gorges can be found along the Gibb River Road. 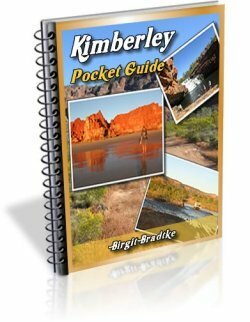 On this page I tell you more about those Kimberley gorges and show you what you can look forward to. Just keep one thing in mind as you look at the pictures on the pages below: once the wet season is finished the waterfalls disappear quickly. To see the falls in all their glory you have to get here early in the season. However, the pools at the bottom of the falls remain, even if the falls dry up to just a dribble. Kimberley gorges are great for swimming at any time. There are of course more Kimberley gorges. 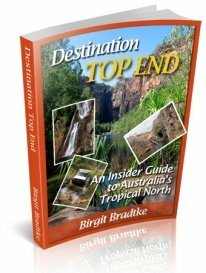 The well known Windjana Gorge and Geikie Gorge are covered on their own pages. Same goes for Dimond Gorge and Sir John Gorge, both located at the Mornington Wilderness Sanctuary, and both absolutely spectacular. 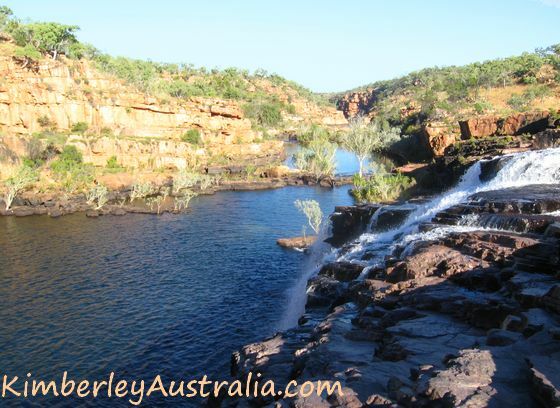 Many of the cattle stations along the Gibb River Road have gorges that you can only access if you stay at their accommodation or take part in one of their tours. Other gorges are far off the beaten track and take a bit more time, experience and equipment to get to. 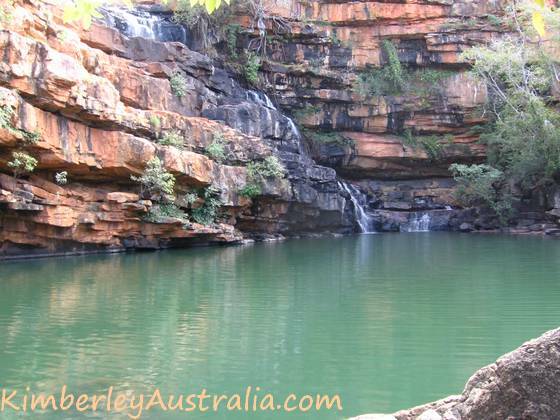 Lennard Gorge is one of the little known and less visited Kimberley gorges. The 8 km long access road is strictly four wheel drive only and will take you to a parking bay. You used to be able to drive a bit further, but the road is now so rough that you are better off walking the last bit. Once you get to the end of the track the walk gets rather challenging. There is no marked path, you have to find your own way (this might get easier later in the season). If you head towards the right you will eventually get to a ledge overlooking the gorge and the falls (very dramatic views). If you stick more to the left you can get to the top of the falls where it is possible to access the water for a swim. Either way, you sure need to bring some time. 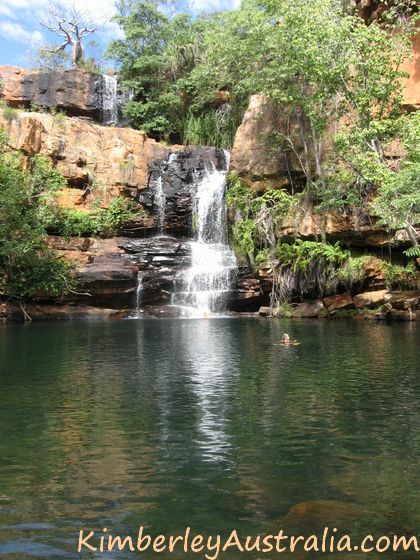 Lennard Gorge is one of the few places where free bush camping is possible. It's not officially allowed, but you can get away with it. Bell Gorge is about 30 km off the Gibb River Road. A short walk along the pretty Bell Creek leads from the car park down into the gorge. The waterfall is cascading down the perfectly U-shaped cliffs, into a deep pool perfect for swimming, with large flat rocks along the side, perfect to sit down, sun bathe, have a picnic or whatever else you can think of. No wonder Bell Gorge is so popular. However, it really has become a bit too popular for my liking. Adcock Gorge is again one of the lesser known gorges along the Gibb River Road. Like Lennard Gorge above or Galvans Gorge below, there is no camping here but it makes a great day stop. It has a beautiful deep green pool with a small waterfall, rock ledges, ferns and grassy edges. Despite it being only 5 km from the Gibb River Road, there shouldn't be too many other people here. To get to Galvans Gorge you leave your vehicle in the car park right at the side of the main road and walk the last kilometre or so. 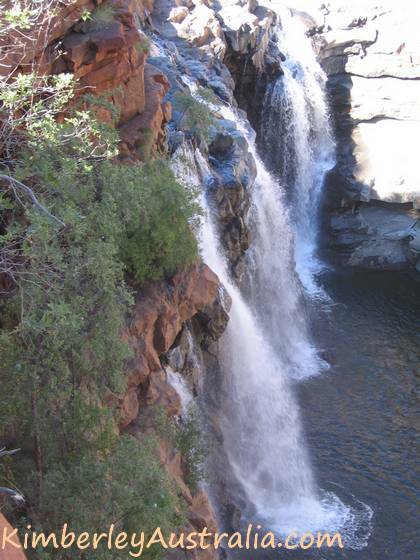 It's the most easily accessible gorge on the Gibb River Road, so it's always busy. 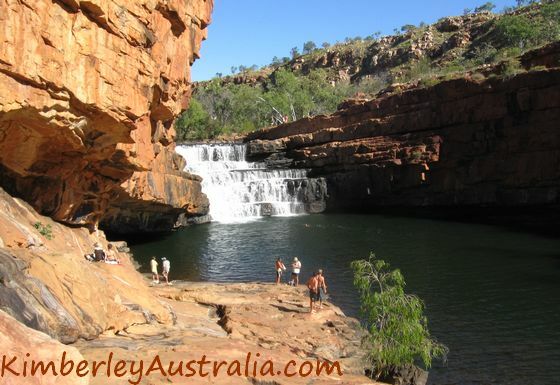 This is one of the smaller Kimberley Gorges, similar in size to Adcock Gorge, but the pool is more than big and deep enough to swim a few laps. There is also a rope in one of the trees to swing on and jump and the falls are big enough to sit on the rocks underneath and get a back massage. All in all Galvans Gorge is a very pleasant spot. Obviously no camping here either. On my very first Gibb River Road trip, Manning Gorge was one of the most memorable Kimberley gorges, for several reasons. We were there early in the season and the falls were still flowing strong, cascading over the full width of the rocks. It was late in the afternoon. While that had a disastrous effect on the photos I took (directly into the sun would have been the only option to show you the full glory of the falls) it also meant we had the whole gorge to ourselves. To get to Manning Gorge you first have to pay a seemingly steep access fee at the Mt. Barnett Roadhouse. However, that fee includes the use of their camping facilities, so if you spend a night there it's not too bad. This is the only official free bushcamping site along the Gibb River Road, and it's great. Update: Camping is not allowed here any more! The track in is very rough, and the gorges themselves are apparently not that spectacular, compared to other Kimberley gorges. (I can't say for sure because I never saw the Barnett River Gorges themselves. The day we were there was the day the owners had chosen to burn the area along the gorge. But the bush camp sites are beautiful. There are a lot of them, mostly clearings along the Barnett River. Just follow the different tracks until you find one that isn't taken. 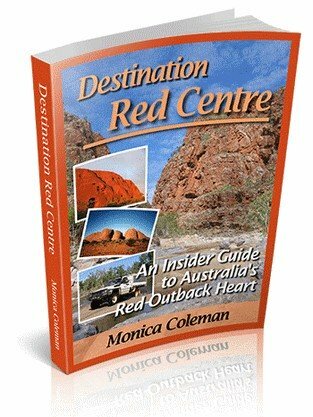 If you like bush camping this is a beautiful place to spend a night before or after visiting Manning Gorge. If you want to get to the Barnett River Gorges take the track to the right at every fork until you get to the river. It's best to park there and walk the last kilometre or so.